In a heavy saucepan bring to a boil, the sugar, cocoa, butter and milk. 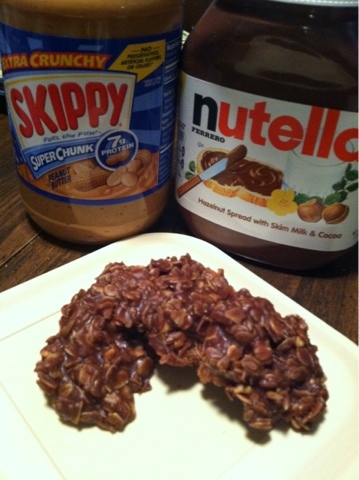 Let boil for 1 minute then add peanut butter, nutella, flax seeds, vanilla and oatmeal. On a sheet of waxed paper, drop mixture by the teaspoonfuls, until cooled and hardened. There are rings from my coffee mug all over my desk. Eek! 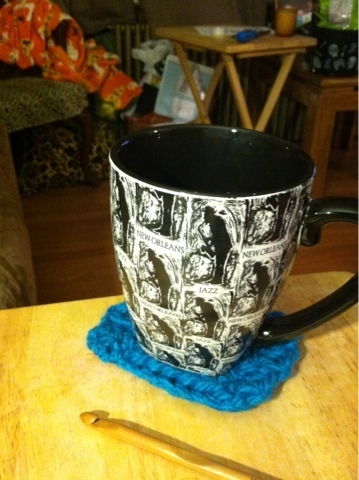 In an attempt not to show the world how bad my caffeine addiction is I crocheted "mug rugs." These will be joining me in Troy in December as well! Would you like them in pairs, sets of four, or singles?? ?